One of the biggest mysteries is the modern world’s impact on snowy owls – here and in the Arctic. Even in the most remote parts of the Arctic, wind-borne contaminants have been detected in many species. And when snowy owls come south, they may be exposed to a host of toxins that can affect their health, especially the potent and deadly new generation of rodenticides. Collaborators in Project SNOWstorm are taking blood and feather samples from many of the owls they capture, and federal and state wildlife agencies are providing the carcasses of owls that were found dead. 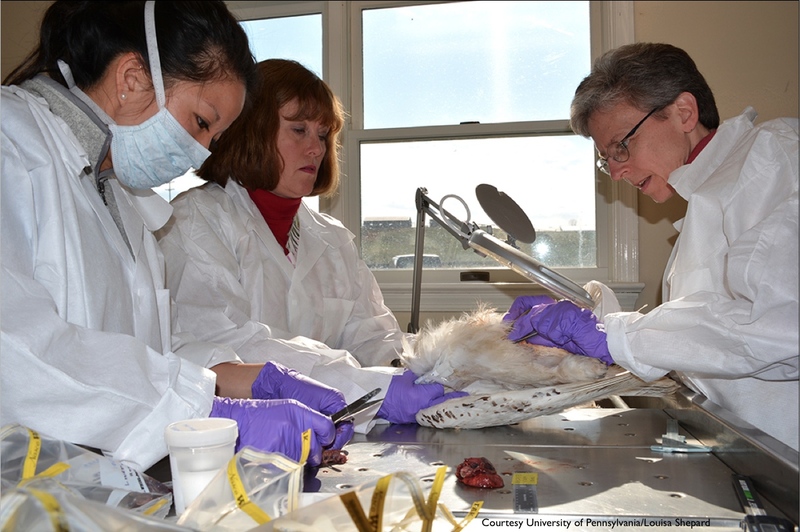 An international team of wildlife pathologists and veterinarians necropsies the dead owls to determine the cause of death, check for diseases and parasites, and take tissue samples to test for a wide range of environmental toxins like lead, rodenticides, mercury and pesticides. By 2017 we had necropsied and tested nearly 160 salvaged owls, the largest and most thorough examination of the health and condition in wintering snowy owls ever. Of particular concern are the alarming levels of mercury that we have detected in many snowy owls. Mercury enters the environment from a variety of sources, including waste incinerators, chlor-akali factories and paper mills, but the largest source in North America are coal-fired power plants. Drifting on the air, it travels around the globe, eventually precipitating into waterways and oceans. Worse, it bioaccumulates in the food chain, so that with each jump up the chain the mercury concentration rises, reaching dangerous levels in top predators like owls. Mercury concentrations in loons and other fish-eating birds on which snowy owls prey can be 10 million times the level in water. The Biodiversity Research Institute in Maine, a SNOWstorm partner, specializes in mercury research, and is spearheading analysis of snowy owl samples to learn more about the degree of mercury contamination, and whether owls wintering in Great Lakes or coastal environments, and feeding on waterbirds, are at greater risk. We have also found that roughly half of all snowy owls tested carry detectable levels of DDE, a breakdown product of the long-banned pesticide DDT. What effect this may have on the owls remains a mystery that we are exploring. In addition, our partners at Laval University in Quebec are analyzing the stable chemical isotopes in the feathers, blood and tissue from live and salvaged snowy owls, which can tell us about where the owls have come from, how their diet may change seasonally, and much else about their lives. Finally, we are also examining the DNA of snowy owls to see what secrets their genetics may reveal.